MAN has begun research into battery second life. To ensure the smooth proliferation of electric vehicles, the need to safely adapt and re-use depleted batteries when that time comes is demanding the attention of researchers and vehicle manufacturers. Vehicles demand very high performance from their batteries. Once the battery’s capacity declines past the 70 per cent or 80 per cent level, depending on the nature of usage, application, etc., the need to swap them would become necessary. The battery, at that point, can still handle a lot of charge and discharge, making it useful for storage in less intensive stationary settings. 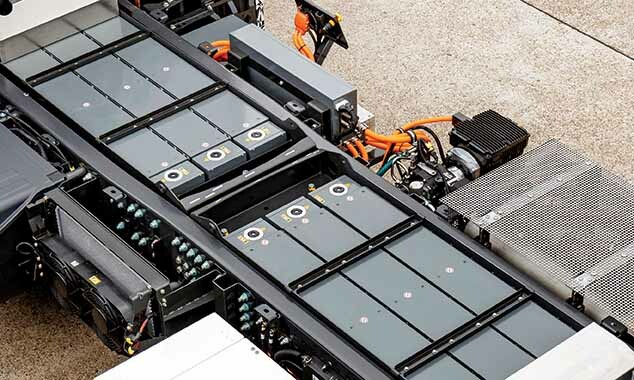 The sheer expense of developing and building batteries for electric vehicles, commercial vehicles especially, makes a compelling case to capture some additional value after their initial use. Their second-life application would delay the need to dispose of them as resource-intensive products with none having yet figured out a way of doing so economically. If storage vendors can resell used batteries as a cheaper alternative to new storage, they could help more people consume their own roof-top solar generation, or reduce their peak demand for example. There are more number of uses that such batteries could address, advancing the progress of a low-carbon grid in the process. To research the second use of batteries from electric buses for energy storage, MAN Trucks has signed a Memorandum of Understanding with German public transport firm VHH. 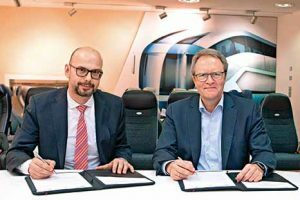 The aim of the project, as part of the mobility partnership between Free and Hanseatic City of Hamburg and Volkswagen Group, is to recycle used batteries into energy storage facilities at bus depot charging stations. The aim of the project is also to sustainably re-use the batteries that are no longer suitable for their original purpose to manage electricity demand at peak periods. Second life application areas of batteries such as these amount to a new territory where there are more questions than answers. The questions involve engineering challenges in taking batteries from mobile use to stationary use. If they will perform as well in the new capacity?. How does one standardise across different degrees of wear and tear?. There is also the matter of setting up markets around used batteries and determining who benefits from that trade. The physics of the transition need to be worked out. MAN expects the batteries in its eBuses to last at least six years, with the rest of the vehicle designed to exceed a 12-year lifespan, giving a regular supply of battery packs for re-use. The second life storage allows the depot to recharge outside of peak periods, then be used to recharge the buses at any time of the day. With new EVs requiring their batteries to meet exacting specifications, it is possible that the ones that come out of the chassis after years of driving will perform at all kinds of different levels. A lot like people, batteries are said to each have their own individual state of health depending upon what they’ve been exposed to and how they’ve been treated over the course of their life. What MAN has embarked upon is therefore not as simple as it may sound. Expressed Florian Hondele, Project Manager at MAN Transport Solutions, “This project underlines our aspiration to provide our customers with a complete range of electrification solutions for their fleet. Since last year, the MAN Transport Solutions team of consultants supporting transport companies and freight forwarders in all matters relating to the transition to alternative drive systems and, above all, electromobility, has been quite active in its work. 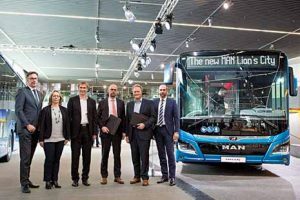 The joint testing of Second Life storage is part of the innovation partnership between MAN Truck & Bus and VHH. “Switching to electromobility means much more than just the purchase of electric buses. The testing of the Second Life energy storage unit fits in perfectly with our holistic strategy,” said Toralf Müller, Managing Director of VHH. Clearly not as simple as it looks, or appears, batteries are made up of multiple interlocking systems (the health of the pack as a whole depends on the health of each of the modules, which in-turn depend on the health of the cells within them). Second-life developers are having to account for the differing wear and tear at each module and each cell in order to standardise the packs and put together storage units that perform at a consistent and predictable level. The positive bit is that the methods to test batteries are not daunting. Evaluators can track rates of electrical charge and discharge, use thermal imaging to screen for abnormal performance, and parse data from the battery management system, which governs its functions. Once the standard (regulation), known as UL 1974, comes out possibly by the end of the year, will guide second-life battery developers in the level of quality they need to meet.